Say Hi to the New: At the sixth level of the Hong Kong International Airport (HKG) Gate 15 is the new Qantas Airways (QF) and British Airways (BA) Joint Business Class Lounge. The Lounge, which originally was combined with the First Class lounge just a floor above it, opened in December 2009 was designed by Marc Newson, Australia’s premier interior and product designer. HKG: Qantas and British Airways Joint Business Class Lounge, a set on Flickr. Hong Kong Airport is about to get busier with the planned third runway that had just gotten government conditional approval, pending environmental review. The one matter at hand: The safety of the Chinese white dolphins, which are protected under the social territory’s law. A recent study by the World Wildlife Fund presented findings that land reclamation for the purpose of the building of the third runway would have a negative impact not only on the dolphins but also to the ecosystem and the region’s fishing industry. HKG: The Wing Business Class Lounge, a set on Flickr. Cathay Pacific’s the Wing’s Business Class Lounge at the Hong Kong International Airport is gearing to close its lounge for a renovation. The Lounge, located on the 7th floor near the Immigration and Customs area, and adjacent to the Wing’s First Class Lounge will temporarily be located on the lower floor (6th floor), closer to the boarding gates 1-4. For LAX and SFO-bound passengers, this temporary Lounge will be convenient, especially if Cathay Pacific continues to use Gates 2 & 3 for LAX and SFO. The renovation is slated to run this early summer of 2011. Afterwards, the Wing’s First Class Lounge will have its turn. Why they decide not to take care of the First Class Lounge first, I am not sure; but let’s hope that the result will be a welcome change. After almost a decade of using the Wing’s FC facilities, some elements start to deteriorate. Plumbing on the shower at the Cabanas causes so much rattling noises that it almost feels as if there were an earthquake. 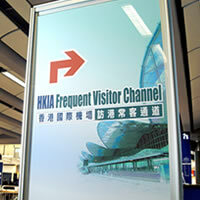 If you travel a lot through Hong Kong (HKG), make sure to apply for the Hong Kong Frequent Visitor Card (HKG-FVC). The card, which allows you a separate (read SPEEDY) lane at immigration (both coming and going), is very easy and very quick to obtain. The initial requirement is for you to travel at least three times into HKG in the past 12 months. After approval and issuance of the card, you will have to travel at least 6 times within a two-year period. I have had the card for a while now, and when you see the serpentine lines at immigration at any time during the day, you will be grateful to have this Frequent Visitor Card in your possession. As mentioned earlier, the card allows you speedy lane both on the way out and on the way in.